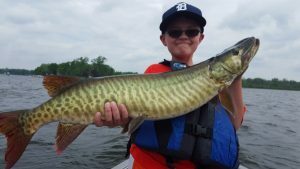 Kosciusko County has 3 musky lakes Tippecanoe, Webster and The Barbee Chain. Webster Lake is the beginning of the water shed and consists of Webster Backwater and Kaiser. The public access is located off of Backwater Road on Backwater Lake. To get to Webster you have to go under the road and down a channel to the lake. Kaiser is south of backwater. 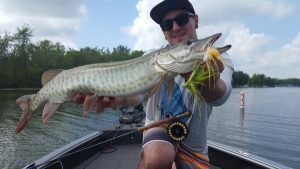 Backwater Lake is a very shallow weedy lake it is very productive early fishing the emerging weeds with bucktails, gliders and jerk/twitch baits, as the weeds come up to the surface throwing ss shads and popping them threw the weeds is the way to go. https://www.facebook.com/Smoker-Tackle-LLC-585409971547445/ Kaiser is about a 20 acre lake it can be productive all year long but since it is back a long channel you might get back there and 2 other boats are already there so choose your days. 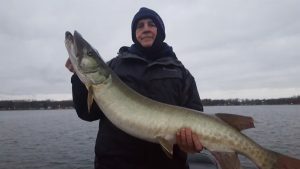 Webster was several lakes that was dammed to make one so there is several deep holes and flats in the middle of the lake most of these lakes are shad based lakes so find the shad and you will find the muskies. Webster empties into James Lake through Grassy Creek. The last 2 state record have come from James Lake. Some good spots to try is the area where Grassy Creek comes into James the whole break line on the in developed side of the lake and the area where James Lake goes into Tippy lake. Tippecanoe Lake is the deepest natural lake in Indiana. Most of the break line on the lake can produce. Oswego is the last lake before the Tippy River starts. The Channel leading to Oswego is a great place to start. The Barbee Chain also leads into Tippecanoe Lake. You will find the public access off of Hwy 13 on Kuhn Lake. The Barbee Chain is made up of 7 lakes (Kuhn, Big Barbee, Little Barbee, Irish Lake, Banning, Sechrist, and Sawmill) Big Barbee is the only one that doesn’t have a 10 MPH speed limit so fishing can be easier when the boats get rocking on Tippy or Webster. The Barbee Chain enters Tippy through Sawmill Lake.